Hello everyone. This is your friendly Canadian neighbor Alouise from the Great White North, eh. You might wonder why there’s a Canadian installment in the supermarket souvenirs post here on Souvenir Finder. When you walk into a Canadian supermarket (or grocery store) you might think it looks like things you can get at home, but look a little closer and you’ll see some differences. Let’s get a big difference out in the open – in Canada we have a law (the Consumer Packaging and Labelling Act) that states manufactured products need to be labeled in English and in French. 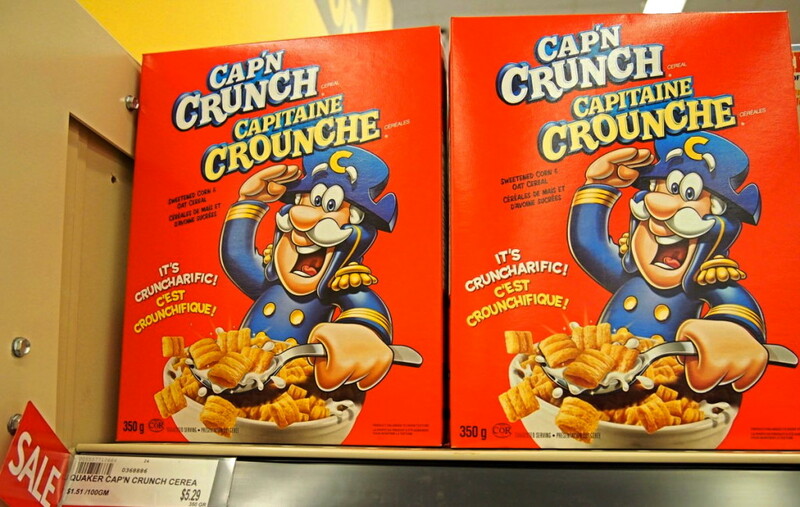 One of my favourite examples of this is looking at a box of Cap’n Crunch/Capitaine Crounche cereal. Of course you could bring back any Canadian product to get the English and French translation. 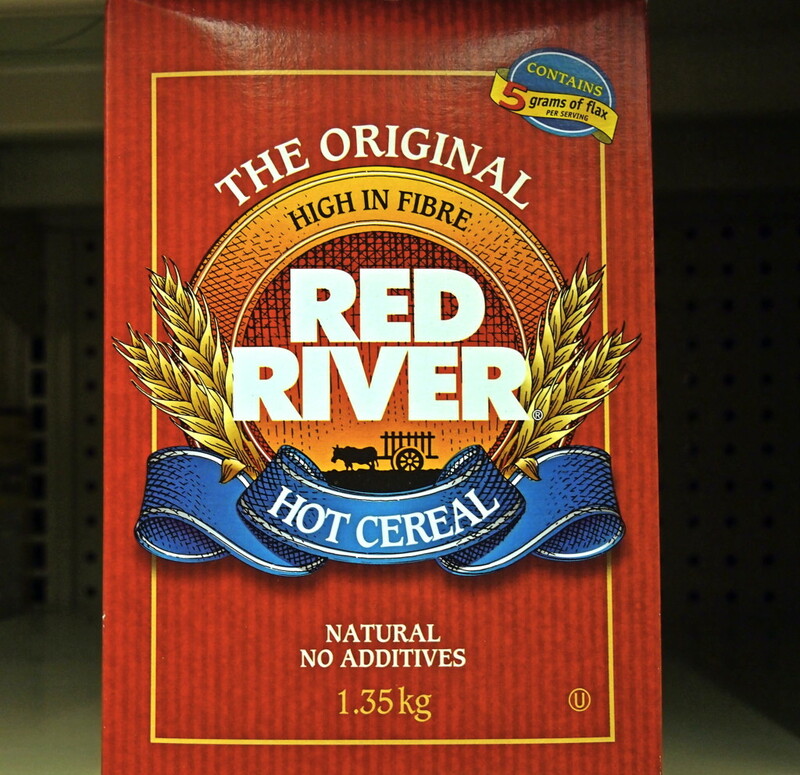 There is a breakfast cereal that is Canadian and that’s Red River (named after the Red River in Manitoba). From what I know this cereal is pretty much found only western Canada (British Columbia, Alberta, Saskatchewan and Manitoba). It’s a hot cereal, like a cream of wheat. Add some milk and maple syrup and you’ve got a great way to start the day. Speaking of maple syrup that’s something we’re pretty well known for. 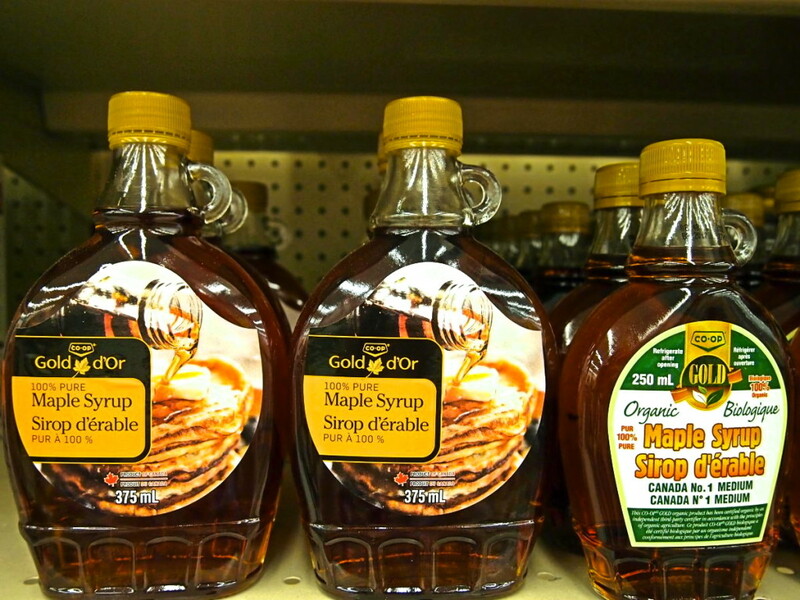 Most of the world’s maple syrup is made in Quebec. While the bottle isn’t in a maple leaf shape, if you pick up a bottle of maple syrup here you’ll pay much less than you would at a souvenir store. Red Rose is brand of tea that’s only found in Canada. 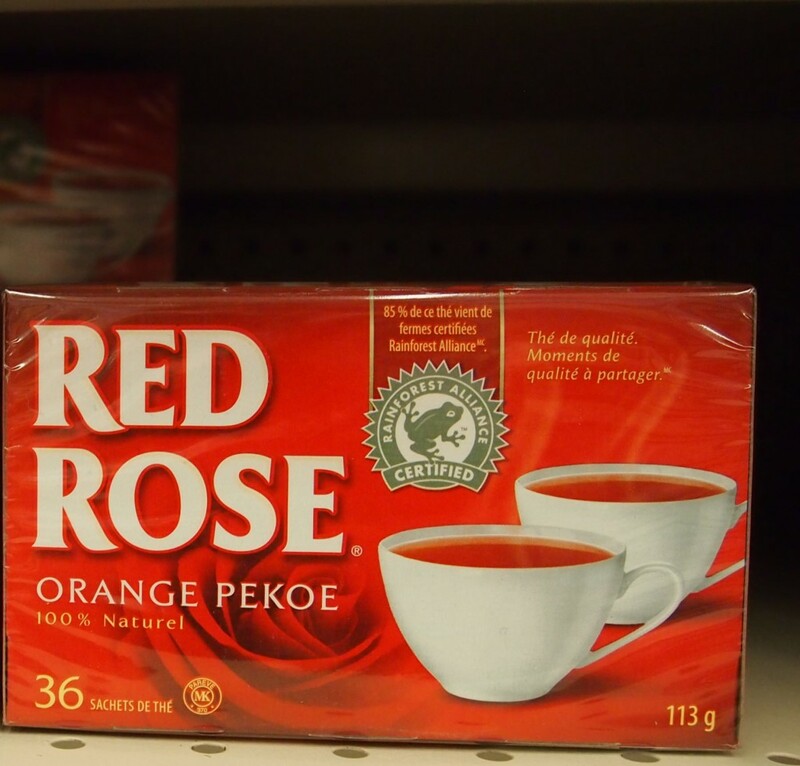 A lot of times when you go to a restaurant or a diner in Canada you’ll see they have Red Rose as their brand of orange pekoe tea. Ed. Note: Red Rose also makes amazing iced tea. Many Canadians love Tim Horton’s coffee (sometimes referred to as Timmy’s). 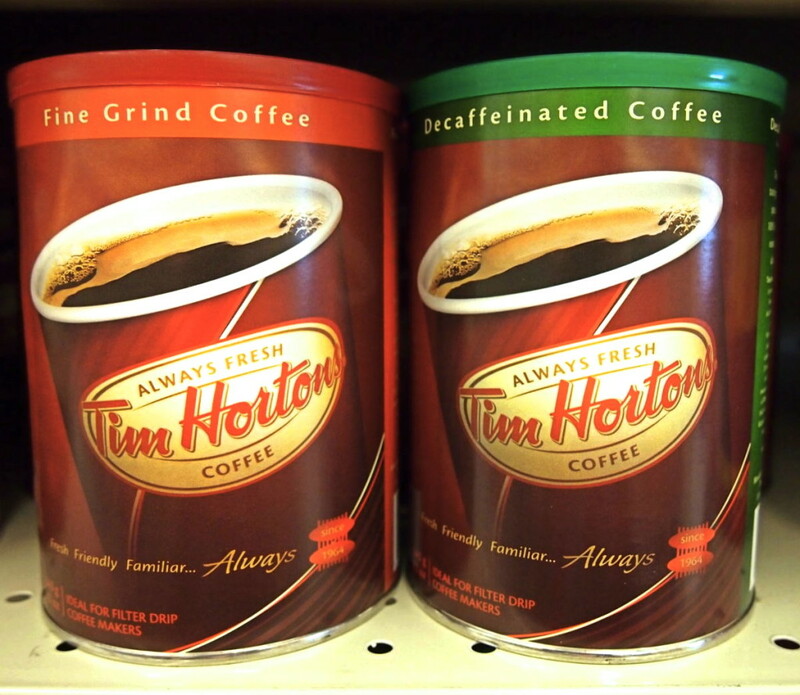 The Tim Horton’s coffee shops can be found in a few US states, but if you live away from the joys of a Tim Horton’s double-double (a coffee with 2 creams and 2 sugars) you might be able to pick up a pack of Tim Horton’s coffee at the supermarket. Another Canadian restaurant chain is Swiss Chalet (despite the name it’s not from Switzerland). 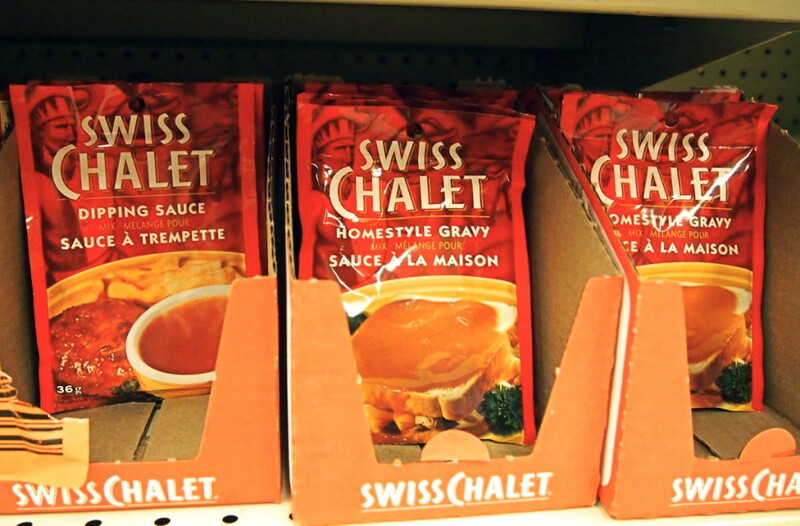 Many people love Swiss Chalet’s dipping sauce, which is like a thin gravy you dip with your chicken. You can often find these powdered mix packs of their dipping sauce and their gravy at the supermarket. 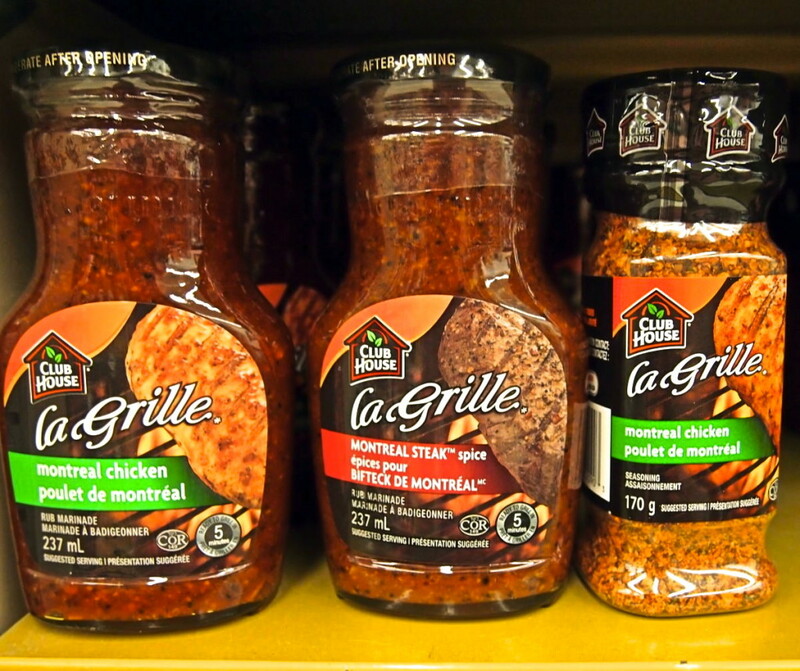 I don’t think the Clubhouse brand is Canadian, but what is Canadian is Montreal Steak Spice seasoning. It’s a blend of spices (originally created by Montreal’s Schwartz’s Deli) to put on a steak before slapping it on the grill/BBQ. The traditional rub isn’t shown here (it was all sold out), but they do have a marinade and a spice blend for chicken. 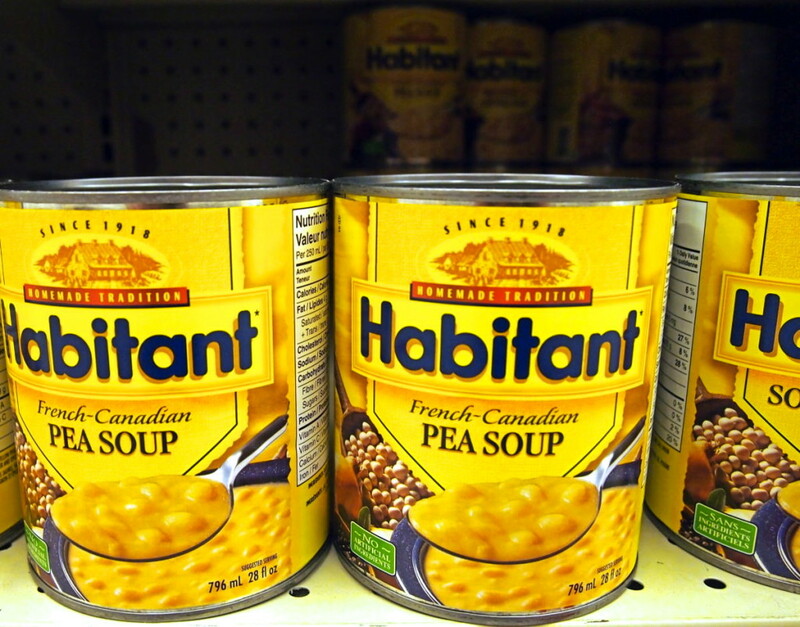 Habitant Pea Soup is a Canadian (French-Canadian actually) product. Habitants refer to the French settlers that originally came to Quebec. The bright yellow label is hard to mistake, and many Canadians can attest to having a bowl or tea of their pea soup during our cold winters. The Caesar is a cocktail invented in Canada. It has vodka, hot sauce, Worcestershire sauce, clamato juice, and is usually served in a tall salt rimmed glass with a celery stalk and lime wedge. 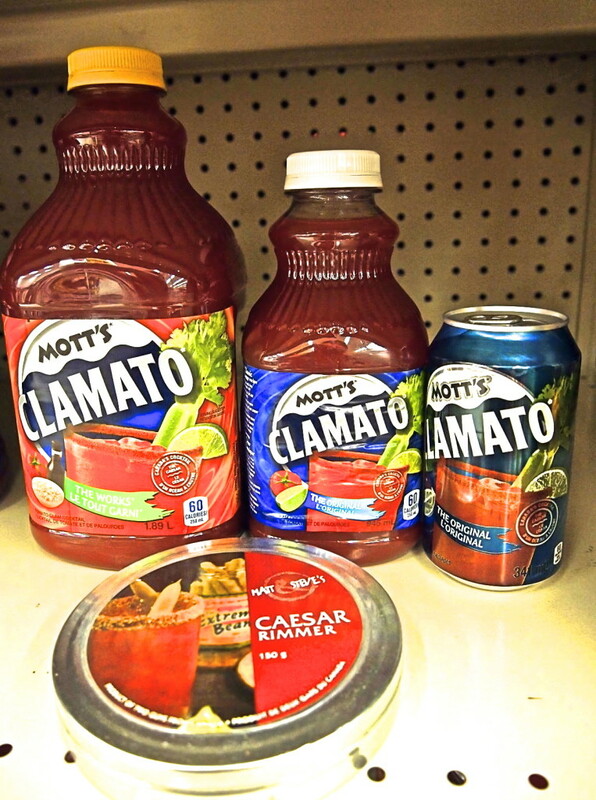 Clamato juice is a mixture of tomato juice and clam juice, and it’s the key ingredient to this Canadian cocktail. In the liquor stores (where I live liquor can’t be sold in supermarkets, but this isn’t the case everywhere in Canada) you can often buy premixed Caesar drinks as well. In the snack aisle you’ll find a lot of foods similar to what you’d find in the US, but there are a few differences. 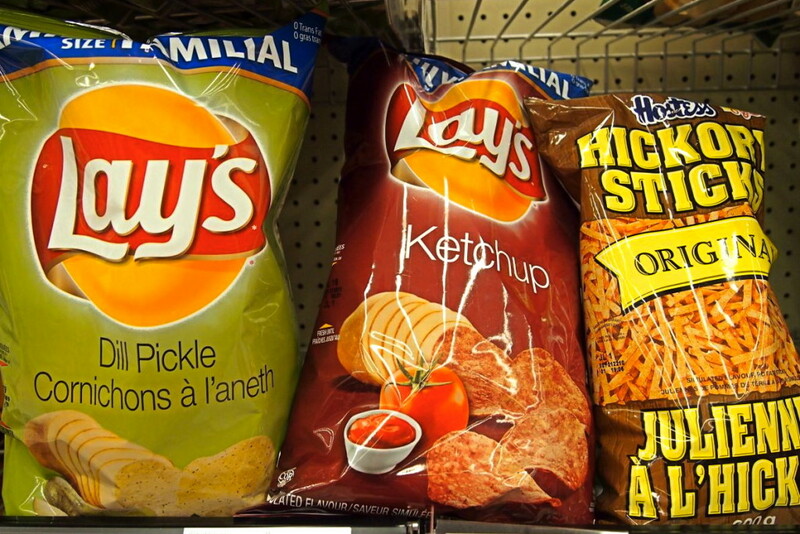 Ketchup chips, dill pickle chips, and hickory sticks are some beloved Canadian snacks, although I’ve heard some places in the US you can get ketchup and dill pickle chips now. 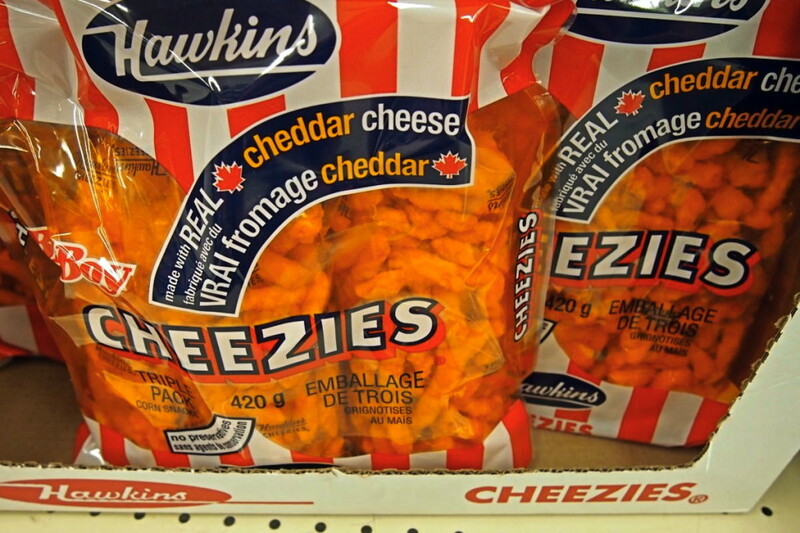 Another Canadian snack food is Hawkin’s Cheezies. They have a sharp cheddar flavour and are very crunchy. 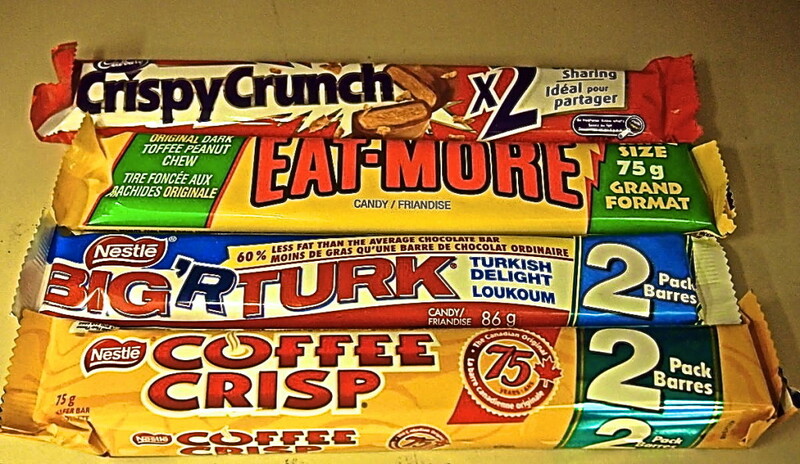 In the chocolate bar aisle (yes we call them chocolate bars, not candy bars) you can find a few Canadian treats. Eat More is a chocolate bar with dark toffee, peanuts and chocolate. Crispy Crunch is like a flaky peanut chocolate bar, kind of like a Butter Finger but crunchier. Big Turk is a raspberry gummy covered in chocolate (apparently, I’ve actually never had one though). My favourite Canadian chocolate bar though is Coffee Crisp, which are layered wafers and chocolate with a coffee flavour. Chocolate and chocolate – that’s a winning combination in my books. Of course Canada is a pretty big country and there are bound to be regional products and items that will differ from one province or territory to the other. Still this is a small sample of some of the souvenirs you could bring back from the Canadian supermarket. 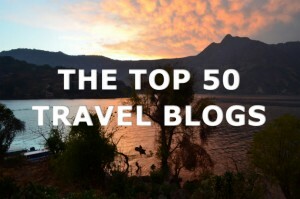 Alouise Dittrick is a writer and travel enthusiast from Edmonton, Canada. 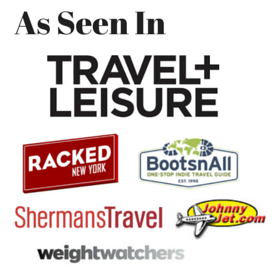 She combines her passion for travel with her love for music, theatre, and festivals on her travel and performing arts blog, Take Me to the World. You can also follow her on Facebook and Twitter. This is great! I brought Pickle and Ketchup chips back once bit did not know about the rest. Are Smarties Canadian? diana – Smarties are from Cadbury (I believe) so they’re technically British, but if you can’t get them in the US you can certainly get them in Canada. Great post Alouise! As a fellow Canadian I used to love the tv commercials for Red Rose Tea where they would have these posh Brits (sometimes Royal look-a-likes) exclaiming “only found in Canada???…. pity” I’m such a tea snob now that when I travel I bring my own tea bags with me.